With the arrival of spring, many of us are feeling a renewed energy – to walk in the sunshine, do some spring cleaning, and turn over the soil in our gardens. For me, it’s time to hunt for morel mushrooms. Springtime is also the perfect time to cultivate our leadership skills and reconsider how we are leading our teams and organizations. Are we creating the right environment for growth – for our people, our residents, ourselves, and our organizations? Last spring, I began a year-long commitment to LeadingAge Michigan’s Leadership Academy. In May, my cohort will “graduate,” and what a marvelous experience it has been. Over the past year, I’ve had MANY conversations, training sessions, and realizations about leadership. 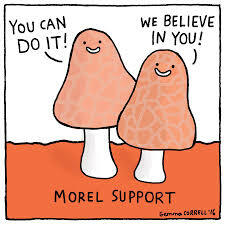 You can’t force morels (or people) to grow. Morels only grow under the right conditions – specifically the right soil temperature, and vegetation (near specific kinds of dead trees). Similarly, your team members need the right conditions to grow. As Rodney Roberson (Administrator at Caretel Inns of Linden, MI) explains, “You cannot change people, but you can help them to understand the result of their actions, and this will hopefully trigger their desire to change.” As a leader, you can create the right environment, so people feel safe to express themselves, reach for higher goals, ask for support, and expand their own mindsets and skill sets. Just like a wildfire can be good for a forest, conflict can be good for your team. To quote the National Forest Service, “We often regard fire as an agent of destruction, but to Nature, it is an agent of change.” Just like natural forest fires can benefit the whole ecosystem (especially morels! ), disagreement can benefit teams. In “The Five Dysfunctions of a Team,” Patrick Lencioni explains that many people consider conflict at work a taboo, and they do everything to avoid it, which ends up wasting time and hindering productivity. With employees who trust each other, heated and passionate debate can help them find stronger solutions in shorter amounts of time. Know thyself, and remember that “Tinker Bell” sometimes makes an appearance. During morel season, energy pulses through my body. I can hardly sleep. When I get into the woods, I want to scurry around like a startled deer, hopping over fallen trees and barreling through briar patches, but this is not efficient or even safe. I need to first take some deep breaths, feel my feet on the ground, and remember what I’m here to do. I looked at maps. I know the trees and terrain. I have a plan. I just need to settle myself down, remember my purpose, and get down to business. In the same way, as leaders (and humans!) we know that all sorts of energy and emotions could show up at any time and especially at trying times … like when the surveyors arrive unannounced… or when an employee is late for the third time in two weeks and disrupts yet another meeting. The thing is – we get to choose how we respond to those feelings. We can let our emotions leak out all over the place (anger, fear, embarrassment, etc. ), or we can choose to take a breath, calm ourselves, and decide on a more appropriate response. When you lead with self-understanding, openness, good communication, clear goals & clear boundaries, you create the right conditions for employees to feel engaged, invested, and ready to grow with the organization. Hope you and your teams have a marvelous spring! And if/when you want to go ‘shrooming, you know where to find me! 1. While you’d think they’d be like other mushrooms and grow in damp places, morels actually like well aerated, loamy soil. This means you might look on hillsides or on higher ground. 2. If you can find the right kinds of trees – ashes, elms, tulip poplar, black cherry, sycamore, and apple trees – you are more likely to find morels. If you can find those trees in dying or recently dead state (with bark sliding off their trunks and littering the ground), you are WAY more likely to find morels.